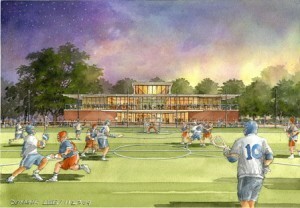 A conceptual drawing of the Cordish Lacrosse Center, as seen from Schelle Pavilion. A view from Homewood Field. 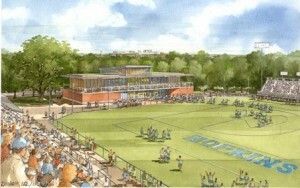 The Cordish Lacrosse Center, named in honor of lead donor David Cordish, a 1960 Johns Hopkins graduate and a three-year member of the Blue Jay lacrosse team, will include locker rooms for both the men’s and women’s lacrosse teams, office space overlooking Homewood Field for the men’s and women’s coaching staffs, a 50-person theatre, a conference room, an academic center and a training room. There will be an indoor reception area on the second floor that leads to an outdoor patio area that can be used for receptions and game-viewing. A field-level entry will serve as a museum documenting the history of both programs with display cases, historical photos and more. The addition of the Cordish Lacrosse Center, which is being funded entirely by private donations, not only provides a much-needed facility enhancement for the programs, but will also significantly enhance the team’s recruiting efforts. In the increasingly competitive world of college lacrosse, Johns Hopkins is committed to providing the resources necessary for both teams to compete for national championships. In addition to Cordish’s gift, several other alumni provided their leadership and support including Joe Cowan, Dennis and David Townsend and Ralph O’Connor. Cowan was the 1969 National Player of the Year for the Blue Jays, while the Townsends are among several father-son combinations who have played lacrosse at Johns Hopkins. O’Connor’s participation continues his support for athletics and recreation as the Johns Hopkins’ recreation center is named in his honor. The Ralph S. O’Connor Recreation Center opened its doors on the Homewood campus in 2002. There will be a ceremonial ground breaking at halftime of the Johns Hopkins-Navy men’s lacrosse game on Saturday, April 23 with construction scheduled to begin in early June. The teams are expected to occupy the facility at the conclusion of the 2012 season with a majority of the exterior of the facility due to be completed by early 2012. The Johns Hopkins men’s and women’s lacrosse programs are currently housed in the Newton H. White Athletic Center, which is located adjacent to Homewood Field. The current facility provides locker rooms and office space for all 24 varsity athletic programs at Johns Hopkins. With the completion of the Cordish Lacrosse Center, space currently occupied by the men’s and women’s lacrosse teams will be available to some of Johns Hopkins’ other highly-successful programs. The Johns Hopkins men’s lacrosse program dates to 1883 and the Blue Jays have produced 44 national championships, nine NCAA titles and 179 First Team All-Americans. Johns Hopkins has currently qualified for the NCAA Tournament 39 straight times, the longest active streak of qualifying for the NCAAs in any Division I team sport. JHU represented the United States in the Olympic Games in 1928 and 1932 and Homewood Field hosted the ILF World Championships in 1982 and 1998. Since its first intercollegiate game more than 125 years ago, Johns Hopkins has been at the forefront of the college lacrosse landscape. The women’s lacrosse program at Johns Hopkins debuted shortly after women were first admitted to the school in the 1970s. Since then, Hopkins has qualified for the NCAA Tournament 12 times, with three of those appearances coming since 1999, when the program was elevated to Division I after a successful run at the Division III level. Johns Hopkins hosted the NCAA Women’s Lacrosse Championships in 1999 and 2001. Updates, including photo galleries, will be available on the official website of Johns Hopkins Athletics throughout the construction process. For questions regarding recognition opportunities, please contact the Johns Hopkins athletics development office at 410-516-6132.